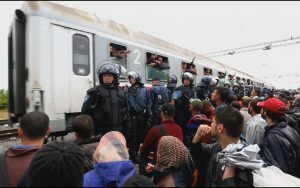 From the Arab Spring to the Paris terrorist attacks: never since World War II has Europe suffered such cycles of violence and population shifts. The geopolitical situation has changed dramatically over the last five years. The turmoil in the Middle East has put Europe on a war footing. Through a wealth of archive material and the staggering testimonies of surviving migrants, this is a report on the dramatic turn of History we are experiencing on a daily basis.